Welcome to Day 5 of my Fit & Healthy New Year & DietBet Challenge! I hope that you are feeling great. We had an intense workout yesterday, 20 Minute Full Body Workout: Boot Camp HIIT-No Equipment-200 Calories Per Round. Today we are slowing it down and stretching out our muscles. Fitness requires strength and flexibility. It will help prevent injury, maintain proper biomechanics and improve your overall level of fitness. I have two videos below, a 30-Minute Yoga Flow & Stretch and my Stretches to Improve Flexibility for Splits video. Working on flexibility for splits can help relieve back and sciatic pain. Remember, with Yoga and Stretching, you don’t want to bounce into any of the movements, or force any of the poses. Wherever your body is today is perfect. With practice you will become more flexible. These workouts can be paired with 30-Minutes of gentle cardio. The goal is to move, but also take some active rest and recovery today. Have fun! We have a good workout for you tomorrow! 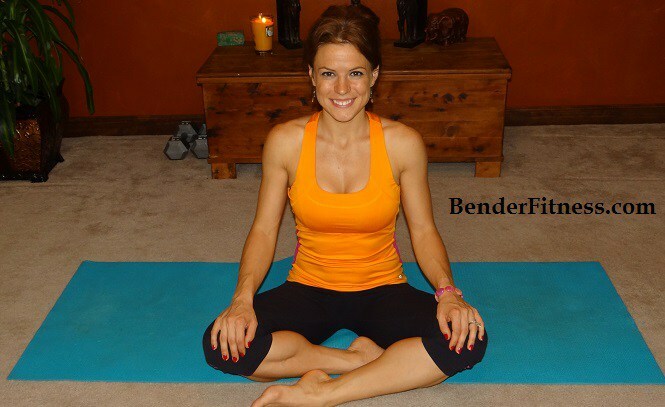 PS You can find me on Instagram and Twitter: @BenderFitness and on Facebook: www.facebook.com/MelissaBenderFitness. Good leg stretch sequence…. I would also advise those new to this kind of stretching, that yes you will get more flexible than you are, but also that you may never achieve full splits, sometimes hip bones get in the way… Paul Grilley (Yin Yoga – Anatomy for Bones) has some good advice on bone versus muscle which is very informative… I personally will never achieve say, full seated butterfly due to the construction of my hip bones. Thanks Melissa for the nice relaxing stretch. This was just what I needed today. Thank you Melissa!